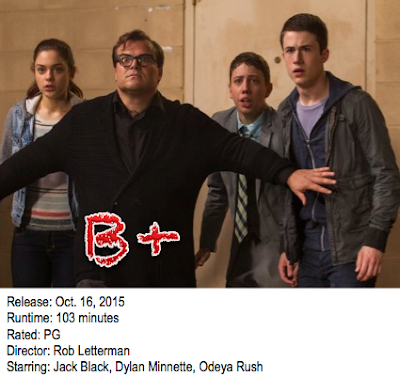 Goosebumps is a perfectly innocent film aimed at young audiences, but with a dose of respect for older viewers as well. Based on the beloved R.L. Stine children’s horror books, the movie is more than a recreation of the original works; it is an augmentation of them. Only here, Stine himself (Jack Black) is in the movie and a part of the action with everyone else. Our young hero, “Zach” (Dylan Minnette), is starting over with his mother in a new city. The girl next door to them is “Hannah” (Odeya Rush), whose father is the famous author R.L. Stine. One of Stine’s big secrets is that his lively imagination, coupled with a magic typewriter, are able to bring to life the monsters conceived in his recluseivity as a child. When Zach and a friend inadvertently release some of these monsters in the town, the Stine and kids have to band together to save their town from annihilation. Although the opening is slow – with some of the same outlandish character quirk exaggerations found in nearly all daytime Disney programming – we are allotted plenty of time for character development—one of the film’s greatest strengths. Another is that the film is formidably scary for kids throughout a wide age range, but is never too horrific for all except the youngest of elementary schoolers. Zach and Hannah have a complimenting vibe together. Director Rob Letterman and his writers (Darren Lempke, Larry Karaszweski, and Scott Alexander) go out of their way to develop this romance, being extra careful to give us details on how their personalities contrast and blend again. It is a wonderful element that exhibits the utmost class, along with one particular setting in the town’s abandoned amusement park. Once the monsters take to the streets, the pace becomes quicker and the pairing to save themselves and each other provides some town-trashing on a much more “smash ‘em up” action-adventure like we’d find in most movies for younger audiences. It feels cheap, but understandably so since CGI monsters are so easily had nowadays. The initial slow build – giving way to character development with a tinge of romance and humor – followed by the lull of the Halloween-themed action, come together to make for an engaging movie that is sure to appeal to nearly everyone. There are a few surprises strewn in here and there, but the final segments are the most emotional. That’s the big separator between this film and so many other enchanting kid flicks: This one reaches out and touches everyone’s heart while so many others tend not to. Combine wit, eccentric direction, aggressive styling, and some touching lessons learned by its characters and you’ve got Goosebumps, which honestly might prove to be one of the better movies in the kiddie division this year.